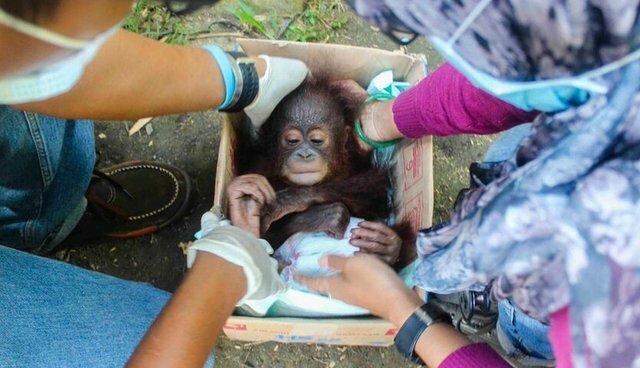 Orangutan 'Tried To Die' After Losing Mom. They Said No. 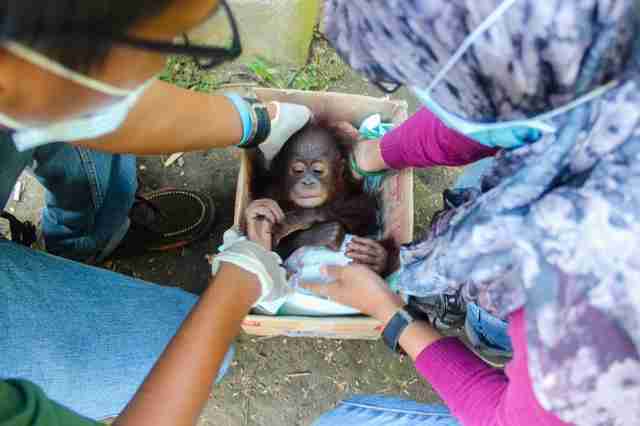 This little orangutan was so depressed he had lost the will to live. But his rescuers wouldn't let him go. Udin was just an infant when he was snatched away from his mother, likely after she had been killed by poachers who wanted to sell her baby as a pet. He was then locked up alone in a small, dark cage, deprived of water, proper food and the love he so desperately needed. 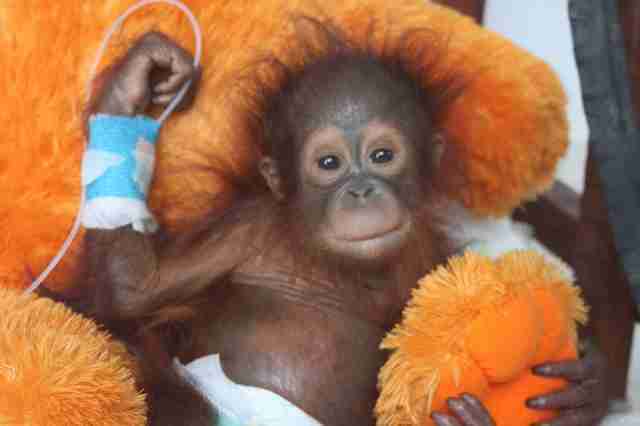 He was finally rescued by International Animal Rescue's (IAR) Borneo orangutan center, but it was nearly too late. Traumatized from losing his mother and ill from dehydration and hunger, the little orangutan didn't want to fight anymore. "Udin showed no interest in his surroundings and wouldn't look at the rescuers trying to save his life," IAR said in a statement. "He was severely malnourished and dehydrated but had no desire to eat, to drink or to live. His mind and body were detaching from the world around him." But his rescuers wouldn't give up. Despite his listlessness, the team pushed him through exercises and stayed with him around the clock to monitor his health and help comfort him. "[He] tried to die several times, but we wouldn't let him," the veterinary team said. Finally, after 10 long days, something changed. The little ape, who wouldn't even respond to rescuers when he first came to the center, began to acknowledge them - and food. Something changed in his spirit as well. "Finally there was a glimmer of light in his sad, dark eyes," the veterinary team said. 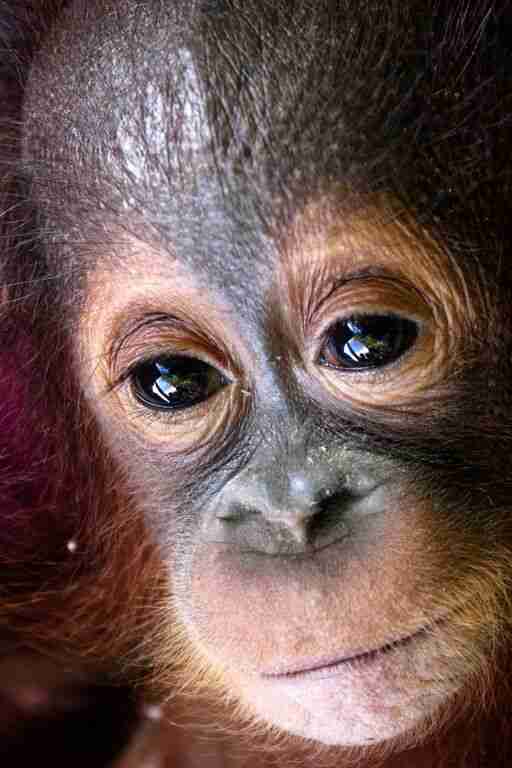 Udin's story is tragically similar to that of Budi, a young orangutan who rescued early this year from life as a pet. Like Udin, Budi had been snatched from his murdered mother and spent 10 months in a chicken cage. When he arrived at IAR, the little orangutan was so malnourished and ill that his body was swollen and frail, and he would scream out in pain whenever he was touched. 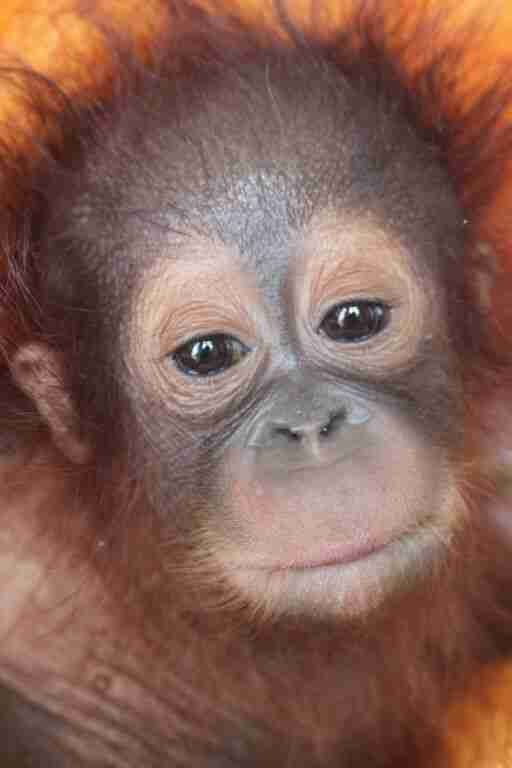 Nearly eight months later, Budi is thriving at IAR. He's best friends with another orphan named Jemmi, and the pair has even joined the "big kid" orangutans to learn how to play and climb and socialize. Unfortunately, stories like these aren't rare - IAR is currently caring for 86 orphans, each one with his own tragic backstory like Budi's and Udin's. If all goes well, Udin's future could be much happier than his past. 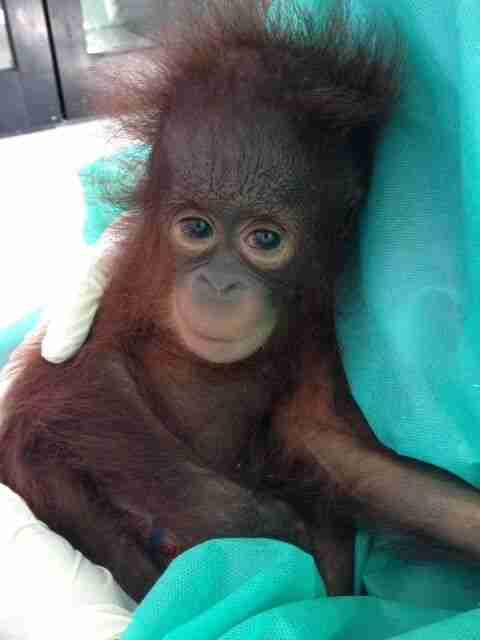 His health is still very precarious, and he requires medical treatment and constant care from IAR staff. "[They] still sleep on the floor beside him so that they can comfort and console him during the dark hours of the night," Alan Knight, CEO of IAR, said in a statement. "He clings constantly to a large fluffy teddy bear, just as he would have clung to his mother in the wild." But with each new day, his spirit seems to be returning bit by bit. And while they're cautious, the medical staff is daring to hope. "Udin still faces a long road ahead but at least now we all dare hope that eventually he will recover," Knight said. 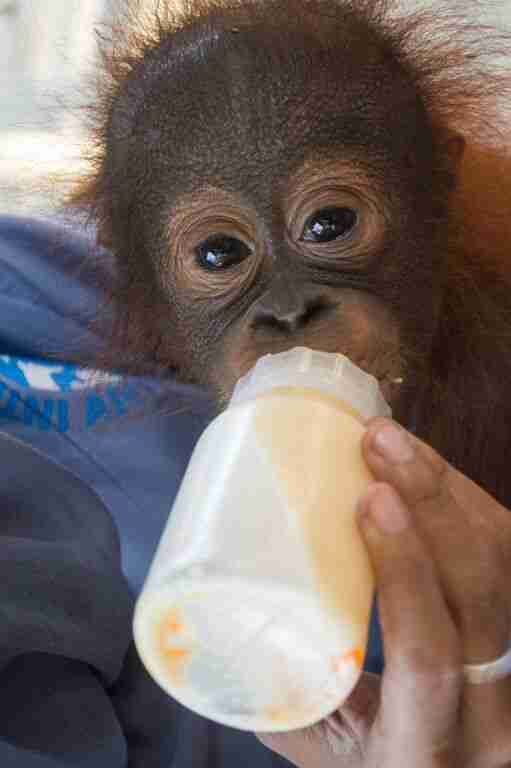 If you'd like to help Udin, Budi and other orangutans like them, you can click here to donate. See below for a video of Udin's journey - it includes a few video clips.